A poor first half (scoring just 11 points) proved too much for the Vikings on Wednesday. Photos by Brian Addison. 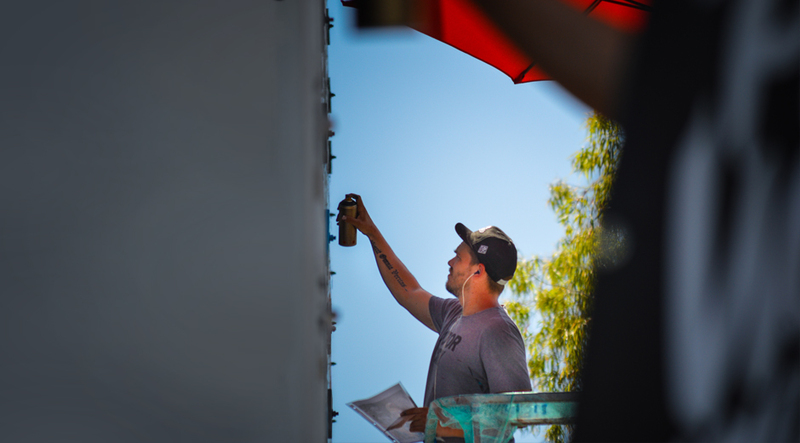 Above: Tristan Eaton paints his mural at the Varden Hotel in DTLB as part of POW! WOW! Long Beach’s inaugural festival. Long before Jasper Wong founded one of the world’s most influential contemporary art collectives, he had to watch his mother’s frozen meat business, their family’s source of income and sustenance for the single mother and her three children, shutter as Costco moved into his small neighborhood Kalihi, just outside of Honolulu. That small business was soon forgotten, like many displaced things in the world, and it left a mark on Wong, a mark that would ultimately result in acknowledging the privilege of having a mother who pushes you toward your dreams, what it feels like to be displaced, and the effects that being forgotten has on the future of those who have to directly deal with its consequences. And seven years ago, he looked to the warehouse-filled Kaka’ako district of Honolulu in a project he dubbed POW! WOW!, a project that had one simple goal: paint some walls. In a sense, Wong was powerfully stating that though his mom’s business may be gone (and many others along with it), that the people are still here. The culture is still here. And there are ways to better the world, even in the places that most of the world has forgotten. The creation of POW! WOW!—what Wong describes as action-to-reaction, akin to “a punch in the face, like in comic books: pow! And the wow!, well, that is sort of your reaction to that work”—has been so successful that it has launched into other places around the world: Taiwan, Japan, the Antelope Valley, D.C., and yes, right here in Long Beach (PWLB). It’s impact in Long Beach has been beyond influential. Per usual, its initial descent into the city prompted ill-reasoned cries of foul play and invasion: “Where are the local artists! ?” pundits screamed (and still do), not realizing that POW! WOW! bringing its artistic power to Long Beach would only help the city’s stature as an arts-supporting municipality. Jeff McMillan paints his mural during the inaugural PWLB. These bits of misinformation, like the lack of knowing the details of Wong’s storied past, lead to the downsizing if not outright fighting against what he and other arts organizations are doing. Wong views it as beautifying; opposers see it as cultural encroachment, an indirect form of displacement, and somewhat amusingly, as a tangible example a corporate takeover. Sometimes, it is only viewed in that light: Boyle Heights, arguably the epicenter of the Southland’s art-as-gentrification sentiment with groups like the Boyle Heights Alliance Against Artwashing and Displacement and Defend Boyle Heights, has ousted what they view as elitist art galleries and even nonprofit arts organizations. The protest of the Nicodim Gallery, where activists scrawled “white art” on its metal door, led to its closure. Unfortunately, the owner of that gallery, Mihai Nicodim, is a Romanian refugee who had to swim across the Danube River in 1983 in order to escape communist persecution and become, in his eyes, a free artist. Coming to the US, he was homeless until he saved enough money to achieve his dream: opening an art gallery. In another instance in Boyle Heights, nonprofit PSSST—an interdisciplinary art space dedicated to providing money, space, and tools for underrepresented artists—was ousted by what founder Pilar Gallego called “constant harassment” by those who deemed them part of the gentrification process. These stores are two of many that complicates and convolutes the issue of art and its intersection with gentrification. When it comes to Long Beach, Wong was no imperialist; in fact, he claims “Long Beach chose us.” After all, it wasn’t until Julia Huang, owner of Long Beach-based interTrend and a believer in the power of public art, directly called him and told him that PWLB must become a reality. Felipe Pantone‘s mural on Frontenac Ct. just north of Broadway; completed during PWLB 2016. PWLB has single-handedly altered the streets of Long Beach: murals, whether they are there for years or only there for weeks, some from of the world’s leading artists like James Jean [pictured top right] or Tristan Eaton to locally-renowned artists like David Van Patten [pictured above left] and McMillan, some hidden or some in the wide open… They all line the streets of Long Beach. The result? The region’s coolest, largest, most unique free outdoor museum—and the new course of PWLB becoming its own sustainable organization. Huang, with the backing and blessing of Wong, knows one reality of this very complex endeavor: there are no definitive avenues for profit project and therefore sustainability becomes the essential cog in keeping PWLB alive for future generations of artists to participate in and viewers to enjoy. Within each POW! WOW! across the globe, securing walls to paint on, raising funds to pay artists and score equipment, and gathering community support doesn’t come without a price—and more than just sweat’n’tears are required to make it all happen. Huang’s vision is no walk in the park: beyond the focal point of the summer festival, she hopes PWLB will become a year-round organization that employs artists with opportunities, influences policy when it comes to public art, and be the home of events beyond the much-famed mural festival. And this work, though hipsters and art lovers alike may find it glamorous, isn’t easy to come by. Huang and her crew have chosen none other than First Fridays co-founder, Live After 5 curator, and overall Long Beach lover Tokotah Ashcraft and Huang’s right-hand creative powerhouse Dani Concepcion to head PWLB through 2017 as it looks to become a more formal, self-running organization. Telmo Pieper of Telmo-Miel sketched before he painted this wall at The Promenade just north of Broadway in DTLB during 2016’s PWLB. This year’s roster includes its largest bunch of Long Beach-based artists: the aforementioned Van Patten and Draculas along with Noelle Martine [pictured above right], who helped Benji Escobar paint his now-covered mural on the backside of the Edison Lofts in DTLB, Ryan Milner, Sparc, Nate Frizzell, Bodeck Hernandez, and Ezra One.